Std AMCTC 5851 dtd 1968. M86 series propelling charges are used in the 175MM M107 Self-Propelled Weapon System. The charge is an adjustable three-increment white bag type. 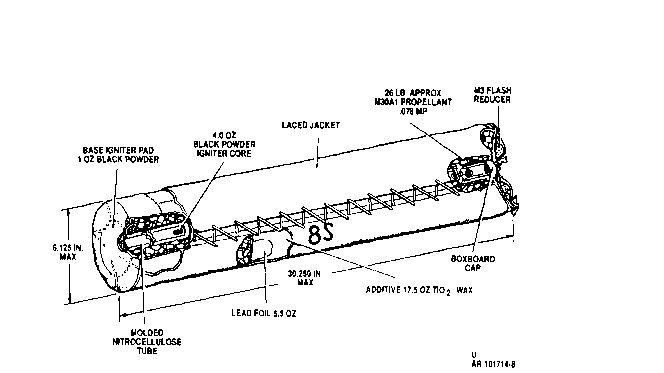 It is approximately 49-1/2 inches long and contains a total of 55 pounds of multiperforated Propellant M6 in acrylic viscose-rayon bags. The bags are tied together by four tying straps attached to the top of Increment 1 and knotted on top of Increment No. 3. The tying straps are reinforced by cord tied tightly around the junction of Increments No. 2 and 3. 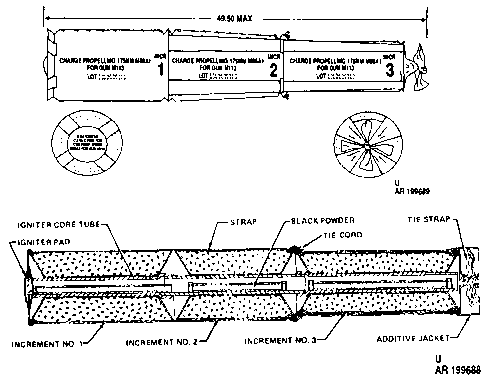 Each propelling charge has an igniter core assembly extending through the center of the charge, The core assembly consists of three rigid polyurethane tubes containing bagged igniter cores of black powder. The igniter tubes for Zones 1 and 3 contain bell shaped ends which assemble over the ends of the igniter tube in Increment 2. A red cloth igniter pad, filled with black powder, is sewn to the base of Increment 1. The igniter core for Increment 1 is sewn to the igniter base pad and is loose in the Increment 1 igniter tube, The cores for Increments 2 and 3 are tied inside the igniter tubes for these increments, An igniter protective cap is placed over the igniter base pad for protection in shipment and storage. An additive jacket is issued separately for assembly over Increment 3 when firing full charge. (The majority of M86A2 charges are shipped with the additive jacket already assembled over Increment 3,) All charges are packed with an M82 percussion primer. An M5 flush reducer is also issued separately to be assembled around the junction of Increments 2 & 3 on certain M86A1 charges, It is designed to reduce excessive blast and flash effects associated with certain lots of Propelling Charge M86A1. The flash reducer, which contains 16 ounces of potassium sulphate, is an apron-type cloth bag designed to be tied around the forward end of Increment No, 2 with its leading edge at the junction of Increment No. 2 and 3.